The Bad Nudes launch at the Fattal Lofts. Photo Erdene Batzorig. The online literary magazine Bad Nudes launched amidst midterms and a full moon. As I made my way up the stairs of the Fattal lofts in Montreal’s St. Henri neighbourhood, my mind was a mess. The Bad Nudes website greets you with an uninterrupted flow of literature and visual arts. The page introduces itself to you with colourful poems from a variety of artists ranging from Montreal-based Concordia students to writers in Toronto. The works, set against a stark indigo webpage, are near and dear to the hearts of the writers and readers alike. They chronicle topics surrounding sexuality, growing up, and of course, love. I entered the balmy loft with a girl I met outside. We made our way inside and settled next to the makeshift stage. As we sat down, we observed the scenery. “So, this is where the cool people are,” the girl remarked. Indeed, the partygoers stood around Fattal, sipping on Pabsts or holding wine bottles in their grip. They were engaged in conversations I was too afraid to interrupt. Whether they were one of the readers, or just there to enjoy the company, each person seemed to be a part of an indie film’s mise-en-scène. Soon enough, Fawn Parker, the poetry editor of Bad Nudes, informed the crowd that the readings were about to begin. Some sat down, while others stood, all like wellbehaved little children who drink alcohol. Maillet also applauded Bad Nudes for creating a comfortable and safe space that allows writers to present their work. 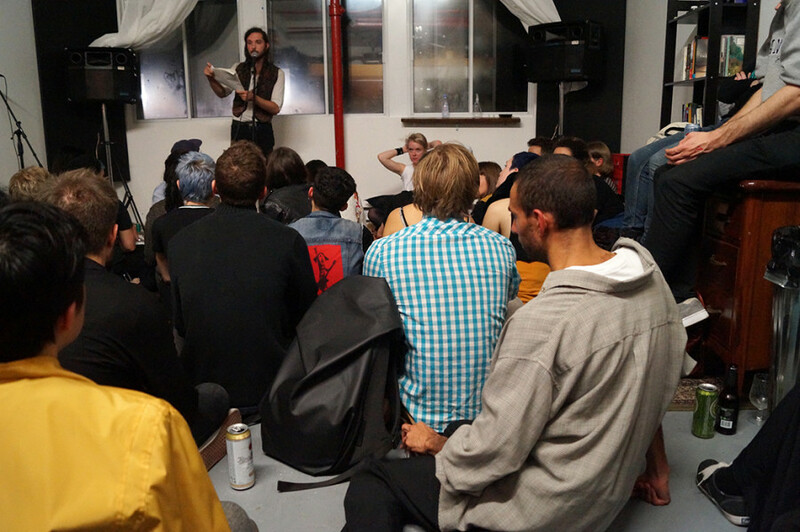 As the night progressed, the diverse group of readers shared not only poetry but also proses and excerpts from plays. Rhiannon Collett, an award-winning playwright, read her endearing poem, “Untitled,” which, similar to her plays, like Miranda and Dave Begin Again, are funny and provocative. The concept behind Bad Nudes started out as a joke during a vacation in B.C., said Parker, but even in the beginning, she took the idea of starting a literary magazine seriously and really “dug their heels into it.” Parker, along with her partners, Thomas Molander and Sandy Spink, worked on their website while reaching out to artists in their networks to feature in the online magazine. The transparency and “ironic and irreverent” tone of Bad Nudes encourages writers to submit their work, she said. In the future, Parker hopes for the quarterly magazine to be in print form. The words featured in the magazine will surely resonate with many—as we are all growing up, experiencing love and heartbreak and figuring out how to cope with the world. That is precisely why Bad Nudes should be in the yellow pages of the millennial poets.